A Device Tree is a data structure describing a system's hardware. Some hardware is "discoverable" by design (e.g. PCI buses or USB buses) while some is not (notably memory mapped peripherals). In the latter case, an operating system executable (the OS kernel) is often hard-coded for one device type. To make an operating system portable across different devices, a description of the layout of each supported hardware configuration is required to ensure the correct drivers and configuration are used. The ARM world is very heterogeneous, each SoC vendor and each board vendor wire their hardware a bit differently. In some other architectures (e.g. x86), there is a standard interface between the board firmware (BIOS) and the operating system to communicate the hardware layout - for instance, ACPI on x86. To overcome this lack of hardware description, the ARM Linux Kernel uses device trees as the preferred format of hardware description beginning around kernel version ~3.2. Prior to this change, all details of how the hardware was wired was part of the platform/machine layer and hard-coded in C structs. This became complicated as more and more ARM SoC vendors and boards appeared. More in depth information is available in the presentation of Thomas Petazzoni about device trees. The device-tree is not only a data structure which describe the SoC's internal memory mapped peripherals, it also allows to describe the whole board. Toradex therefore creates device trees for each module as well as each carrier board (given that the modules Linux BSP supports device tree, see table below). However, especially if a custom carrier board is built, it is likely that you as a customer need to modify the device tree too. This article provides information how to do that. Some of our Linux BSPs make use of device tree enabled Linux kernels. The device trees are part of the Linux kernel source code and located in the arch/arm/boot/dts/ folder. For instructions of how to obtain the Linux source code for each module, refer to the article Build U-Boot and Linux Kernel from Source Code. We provide a carrier board level device tree file (ie. eval-v3) that is compatible with our evaluation carrier boards. Due to the standardized hardware interfaces of the Colibri and Apalis modules, this device tree file often also works for other carrier boards (e.g. our evaluation board device trees do work on the smaller carrier boards like Iris or Ixora). However, a custom device tree may still be required for a custom carrier board to allow enabling non (Colibri/Apalis) standard devices such as secondary Ethernet or disabling unused devices (preventing unnecessary drivers from loading and reducing boot time). The Linux kernel needs device tree binaries (*.dtb) to boot. These binaries are generated by the device tree compiler from the device tree source files. The compiler is part of the Linux sources and is automatically built if needed. The kernel build system provides the dtbs target which compiles all device trees which are compatible to the current kernel configuration. ARCH and CROSS_COMPILE must be set and the kernel must be configured before device tree binaries can be compiled. By specifying a single device tree file, a specific device can be built. Nodes can be referenced using the ampersand (&) character and the label. A more detailed description of the device tree data structure can be found at devicetree.org. The command make dtbs should now compile also this new device tree binary. We recommend to alter only this carrier board level device tree using the techniques below. Tip: The kernel build system writes the combined device tree to the drive, e.g. arch/arm/boot/dts/.vf610-colibri-my-carrier.dtb.dts.tmp. The combined dts file can be handy to debug what the actual device tree file will look like. The combined file is ultimately compiled into the device tree binary representation (*.dtb) which is used by the kernel to boot. To overwrite a property, the node needs to be referenced using the ampersand character and the label. Later device tree entries overwrite earlier entries (the sequence order of entries is what matters, hence the include order matters). Typically the higher layers (e.g. carrier board device tree) overwrite the lower layers (e.g. SoC device tree) since the higher layers include the lower layers at the very beginning. An important device attribute is the status property. It allows devices to be activated/deactivated. 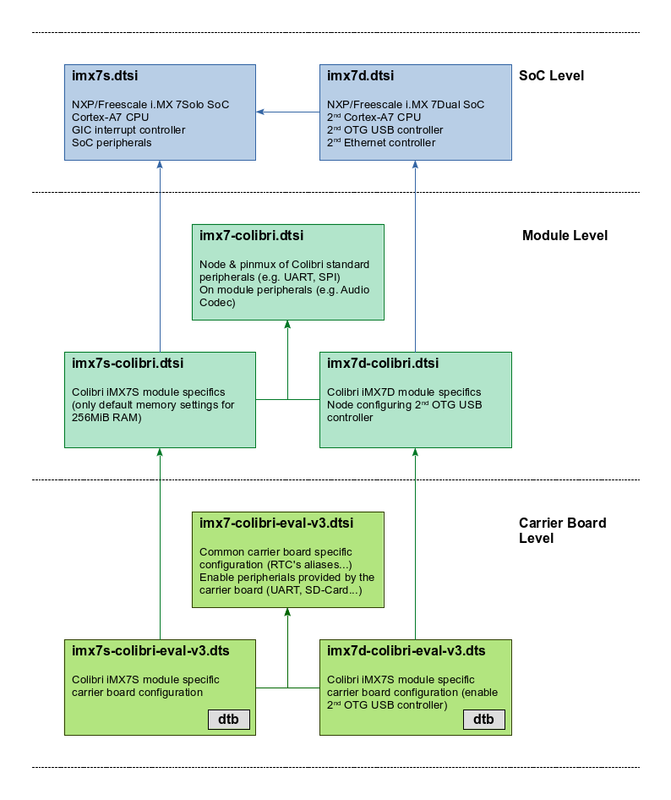 A lot of devices are specified in the SoC level device trees, but are disabled by default. By referencing the base node (using the ampersand character and the label), the device can be enabled by any of the layers overwriting the status property. Whole nodes can be overwritten by simply redefining them. Like overwriting properties, latter definitions overwrite earlier definitions. To delete a node, use its name, e.g. If resources of another device are required, a reference is used to connect the two devices. Typically this is used to assign resources such as interrupts, clocks, GPIOs or PWM channels to a device. Depending on the referenced device, a specific amount of parameters (cells) are necessary. The amount is defined in the -cells property of the parent device. This means that the GPIO need to be referenced using two cells, e.g. This example assigns a single GPIO from the GPIO controller with the label gpio1 (referenced using the ampersand character &), and passes it the two cells with a value of 10 and GPIO_ACTIVE_LOW. The meaning/order of the cells depends on the parent device type. The parent device device tree binding documentation should contain more information on that. The second cell (GPIO_ACTIVE_LOW) specifies the GPIO polarity (GPIO_ACTIVE_LOW is a preprocessor macro defined as 1). This example assigns GPIO 10 of the GPIO bank represented by gpio1 as the interrupt of a device. Almost all peripherals need signals multiplexed to external pins in order to operate. The Linux kernel introduced the pinctrl subsystem around 3.1/3.2 and has especially become important in the device tree world. The exact workings of pinctrl (muxing, pin configuration etc.) varies quite a bit between different SoC vendors; therefore, device tree bindings are not standardized across our modules. Refer to the module specific sections below for how to define a pinctrl block for the module you are using. The device tree bindings for most supported hardware devices are documented in the kernel source tree inside the folder Documentation/devicetree/bindings/. One can also read the latest version of them online at kernel.org. However, bindings might have been changed between the actual kernel version used and the one documented online; hence when in doubt, use the documentation in the source tree. Another source of device tree bindings are those provided by other boards. The device tree folder arch/arm/boot/dts/ contains a vast amount of supported ARM boards which might make use of device tree bindings for already supported hardware. The device tree files for the Colibri VF50/VF61 modules are quite similar, hence the common device tree nodes have been factored out to vf-colibri.dtsi and vf-colibri-eval-v3.dtsi. Click on the box to see the current version of the respective device treee file. A device tree for a custom carrier board can also implement this extra dtsi for the common nodes between Colibri VF50/VF61. 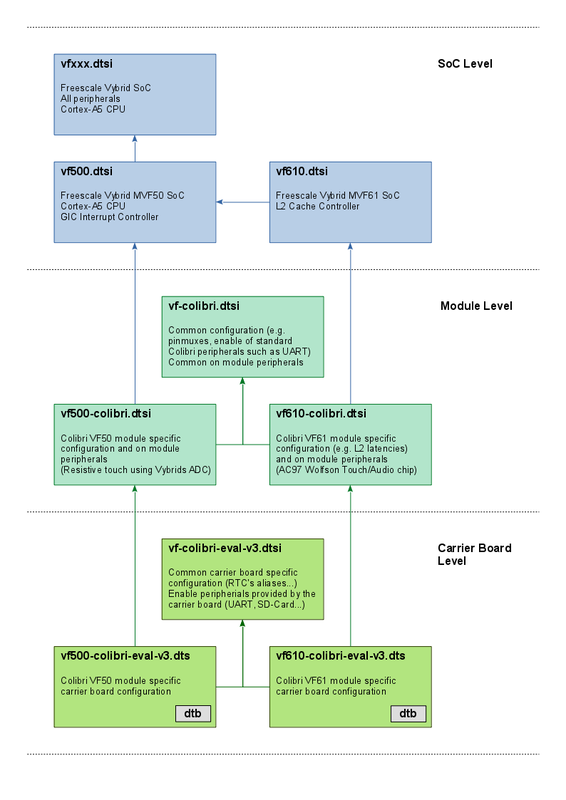 If the carrier board will only use Colibri VF50 or only Colibri VF61 anyway, the nodes of the common device tree file (vf-colibri-eval-v3.dtsi) can also be included in the main carrier board device tree (e.g. vf500-colibri-eval-v3.dts). Pin configurations such as pinmux or drive strength settings are defined by the pinctrl-vf610 driver. The base device tree vfxxx.dtsi defines the base configuration and allows these entries to be extended through the iomuxc label. To configure a pin, a device tree node inside the pin controller node with the property fsl,pins is required. Cells need to be assigned to the property, each pin requires 5 cells. However, the first four are usually given by a pre-processor macro (see arch/arm/boot/dts/vf610-pinfunc.h), only the last cell need to be provided. This last cell contains the pin settings in a hexadecimal notation. For further details see Chapter 4.2 of the Colibri VFxx data sheet or/and Chapter 6 of the NXP®/Freescale Vybrid reference manual. On Vybrid almost all pins can be used as a GPIO. To be able to use a pin as a GPIO, a valid GPIO pinmux must be present in the device tree. Our default device tree contains such a pinmux entry for all pins which are defined being a GPIO by default (refer to the datasheet). For the other pins, make sure no driver is requesting them and create a proper pinmux configuration according to the Pinmux chapter. There are 5 GPIO ports on Vybrid, represented by the node references gpio0 through gpio4. Each of which can address up to 32 GPIOs. Which GPIO port is used is defined by the GPIO node reference, the GPIO number within the port is the first cell. The assignment of the to Colibri pins to the GPIO blocks/numbers can be found in the Colibri VFxx Datasheet, Chapter 4.4 List Functions, GPIO port column. The GPIO polarity cell need to be chosen according to the drivers/electronics needs. There are also preprocessor macros which can be used instead of the numbers (GPIO_ACTIVE_HIGH/GPIO_ACTIVE_LOW). Note: Vybrid starts counting its GPIO banks with 0, hence the first bank is available under the label gpio0. To use a SO-DIMM as GPIO using the sysfs interface (see GPIO (Linux)), a valid pinmux configuration is required. 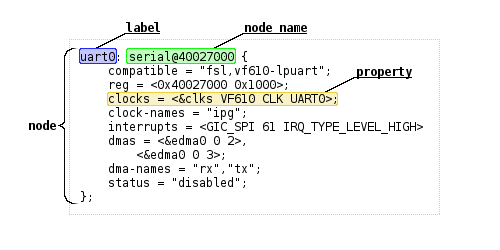 Most GPIOs have a valid configuration in the vf-colibri.dtsi device tree under the node additionalgpios. In this case, add an Pinmux entry as described above. In case the pin is already in use by a different driver, the error code would be "Device or resource busy". Make sure the SO-DIMM pin in question is not in use by any driver. In case a driver is referencing it, you can disable the driver. The modules Colibri iMX6S/iMX6DL share the same device tree binary, so do the modules Apalis iMX6D/iMX6Q. Click on the box to see the current version of the respective device tree file. Pin configuration such as pinmux or drive strength is either set by pinctrl-imx6dl or the pinctrl-imx6q driver. 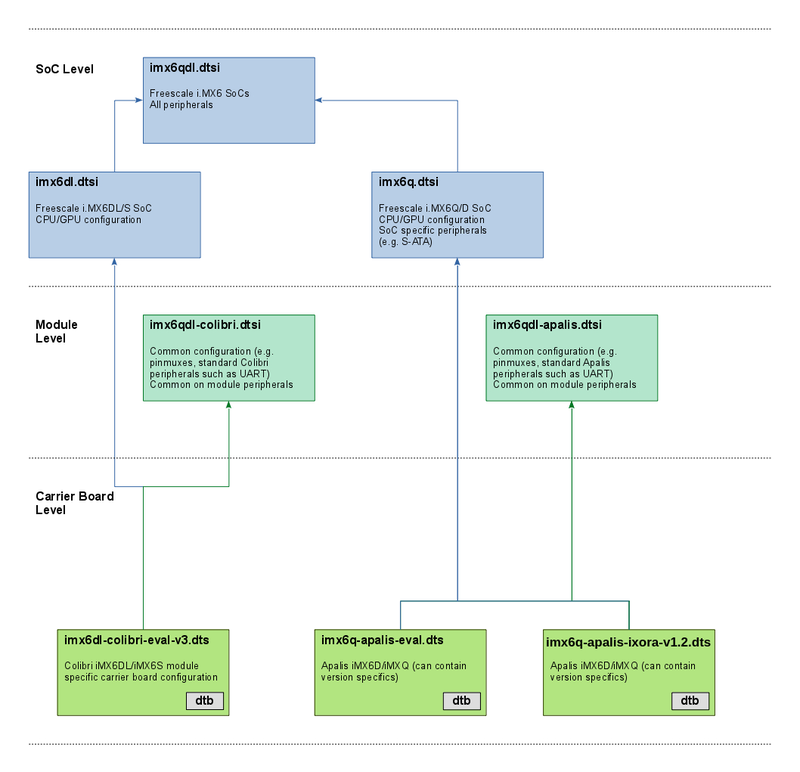 The SoC level device trees defines the base configuration and allows to extend entries through the iomuxc label. To configure a pin, a device tree node inside the pin controller node with the property fsl,pins is required. Cells need to be assigned to the property, each pin requires 5 cells. However, the first four are usually given by a pre-processor macro (see arch/arm/boot/dts/imx6dl-pinfunc.h or imx6q-pinfunc.h respectively). The macros consists of three parts, a prefix, the pad (or ball) name (as used in datasheets) and the alternate function name. Since each pad has multiple alternate functions, there are multiple macros for a single pad, all ending with a different alternate function. It is crucial to select the correct macro for the intended use (e.g. the macro which contains GPIO as alternate function if the pad is going to be used as a GPIO). The 5th and last cell of a pin muxing entry need to be provided as a number in the device tree. This last cell contains the pin settings typically in a hexadecimal notation. Additionally the last cell's bit 30 is used to give the setting of the SION bit, bit 31 prevents the iomuxc from changing the pad control register (see here for details). There are preprocessor define for commonly used default pin configurations (e.g. PAD_CTRL_HYS_PU). The bitwise definition for the last cell is given by the registers of the i.MX6 Input/Output Multiplexer Controller. For further details see Chapter 4 of the Toradex Colibri or Apalis iMX6 data sheet or/and Chapter 36 of the NXP®/Freescale i.MX6 application processor reference manual. 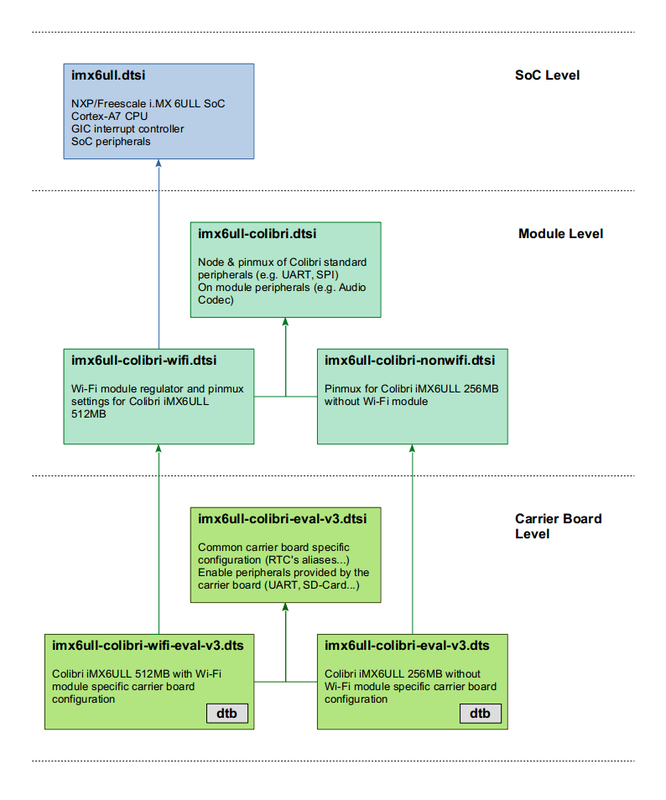 Both versions of the Colibri iMX6ULL modules (256MB without Wi-Fi and 512MB with Wi-Fi) share the same SoC-level device tree file (imx6ull.dtsi) and there are dedicated files to each module. The i.MX 6ULL SoC allows to multiplex pins through its Input/Output Multiplexer Controller (IOMUXC). Beside multiplexing pins, this controller allows also to set pin configuration such drive strength. There are two largely independent controllers: the IOMUXC and the IOMUXC LPSR (low-power pin controller). The SoC level device trees defines the driver node for each of this controller which bind to the pinctrl-imx6ul driver and defines the labels iomuxc and iomuxc_lpsr to give lower level device tree access to the node. To configure a pin, a device tree node inside the pin controller node with the property fsl,pins is required. Cells need to be assigned to the property, each pin requires 5 cells. However, the first four are usually given by a pre-processor macro (see arch/arm/boot/dts/imx6ull-pinfunc.h or arch/arm/boot/dts/imx6ull-pinfunc-lpsr.h respectively), only the last cell need to be provided. This last cell contains the pin settings in a hexadecimal notation. Additionally the last cell's bit 30 is used to give the setting of the SION bit, bit 31 prevents the iomuxc from changing the pad control register (see here for details). Since i.MX 6ULL SoC shares pin assignments with the i.MX 6UL SoC, various pin assignments for both processors are in the file arch/arm/boot/dts/imx6ul-pinfunc.h, which is included to arch/arm/boot/dts/imx6ull-pinfunc.h. The bitwise definition for the last cell is given by the PAD Control Registers of the i.MX 6ULL Input/Output Multiplexer Controller. For further details see Chapter 4 of the Toradex Colibri iMX6ULL data sheet or/and Chapters 4 and 32 of the NXP®/Freescale i.MX 6ULL application processor reference manual. The modules Colibri iMX7S/iMX7D use independent device tree binaries, but due to the high intersection most of the logic is in shared device tree source files. The i.MX 7 SoC allows to multiplex pins through its Input/Output Multiplexer Controller (IOMUXC). Beside multiplexing pins, this controller allows also to set pin configuration such drive strength. There are two largely independent controllers: the IOMUXC and the IOMUXC LPSR (low-power pin controller). The SoC level device trees defines the driver node for each of this controller which bind to the pinctrl-imx7 driver and defines the labels iomuxc and iomuxc_lpsr to give lower level device tree access to the node. To configure a pin, a device tree node inside the pin controller node with the property fsl,pins is required. Cells need to be assigned to the property, each pin requires 5 cells. However, the first four are usually given by a pre-processor macro (see arch/arm/boot/dts/imx7d-pinfunc.h or arch/arm/boot/dts/imx7d-pinfunc-lpsr.h respectively), only the last cell need to be provided. This last cell contains the pin settings in a hexadecimal notation. Additionally the last cell's bit 30 is used to give the setting of the SION bit, bit 31 prevents the iomuxc from changing the pad control register (see here for details). The bitwise definition for the last cell is given by the PAD Control Registers of the i.MX7 Input/Output Multiplexer Controller. For further details see Chapter 4 of the Toradex Colibri iMX7 data sheet or/and Chapter 8 of the NXP®/Freescale i.MX 7 application processor reference manual.